We began our interview with Paul by asking him questions about structural considerations that have to be weighed for each installation, on a case-by-case basis. Q. Let’s say I’ve never considered having a driveway gate before. I have, consequently, no idea of what installation costs I might incur, since I have no idea of the challenges the installer will face. Could you give us some examples, Paul, of challenges in installation that you commonly encounter? For instance, in cold climates, how do you counteract the shifting of pillars due to the freeze-thaw cycle? A. 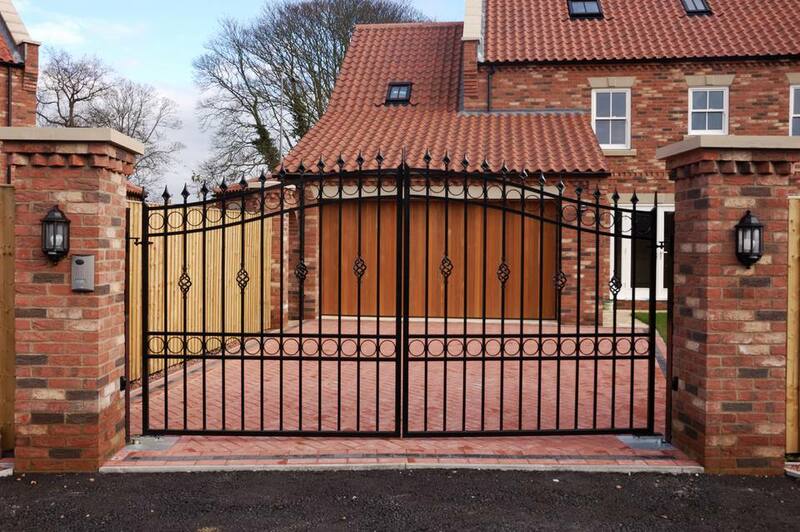 For one customer we put in a double driveway gate at 18 feet wide. It was installed with two massive cement block pillars. They sat on a single foundation that spanned under the driveway, so it was a monolithic pour of concrete, re-enforced with a metal rebar cage. The idea was to have a foundation sitting below frost levels and provide extreme control over any shifting in the pillars due to frost and ground settlement. This eliminated the chance of the two ends going out of alignment. Q. What is another common installation challenge of which the average consumer may be unaware? A. The driveway of the client I just mentioned posed another problem: It was located on a slope, so the doors could not swing open, they had to slide parallel with the rest of the front fence. This eliminated some of the possibilities of having a pedestrian gate at the side of the driveway gate. We had to consider the driveway gates opening in towards the property, so you could pull into the drive from the roadway without getting your car hit. But when we looked at the driveway slope, we saw it was too steep to open them inward without raising them up a few feet for ground clearance. Q. What other general tips do you have for consumers contemplating installation? A. Other considerations would be any bylaw restrictions for height and location setbacks from property lines or road edges. Will a driveway gate block a neighbor’s view of the street when they are leaving the driveway? Is it set far enough in that a vehicle can sit comfortably off the road while opening it, so as not to be hanging out half way in traffic? What bylaws are in place that determine fire code and firefighter access to your property? Something also to consider is, for those who have their yards snow-ploughed by contractors, instruct the contractors not to pile the snow in a way that can prevent you from fully opening your driveway gate. Or if it is a locking gate, how do you give your contractor access for either snow clearing or summer maintenance when you are not at home? Through 9 years of working in the trade, along with achieving a degree and diploma in Landscape Architecture through Ryerson University in Toronto, Canada, Paul has gained vast experience in the landscape industry. He is able to plan elements of design work based on his years of experience spent as a professional gardener, a contractor, and a stone sales rep. In co-ordination with “GardenStructure.com” and his design company “Hands In Nature, Landscape Designs” (both based in Canada), Paul is able to bring this knowledge forward to his clients.